Eb626 Black Cutaway 15 x 10yd. 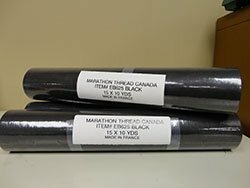 Embroidery Stabilizers > Eb626 Black Cutaway 15" x 10yd. This is a soft feel medium-heavy weight 2.4 oz. 70g/m� non woven cutaway made from cellulose and polyester with needle lubricants to promote needle glide.